Is it better to outsource your accounting or invest time and money in a protracted hiring process? Is the advice different for start ups? This post seeks to do some myth-busting when it comes to outsourced accounting services. True or False: Outsourcing is only a short-term solution. You bring in an expert on a to perform accounting duties on an interim basis. True or False: You’ll pay a premium for outsourcing services. It’s better to hire in-house staff. True or False: Internal teams, i.e. individuals you hire, are better qualified, engage in more continuing education, and bring more experience to the job. 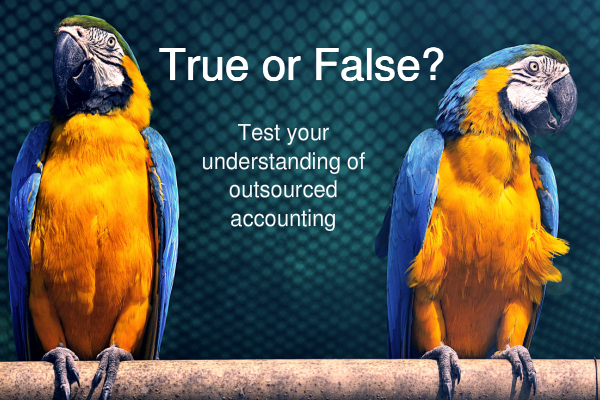 True or False: Outsourced accounting teams are not a good solution for startup companies. True or False: Moving the accounting function offsite is a complex process that takes a while to implement. False Outsourcing is a long-term solution. Increasingly, entrepreneurs and CEOs are looking to outsource any and all functions that they can; reserving in-house hiring for core competencies. To illustrate, a company may wish to hire in-house engineers, researchers, designers, etc. that contribute to the expertise and knowledge base of the company. Other areas: accounting, marketing, IT, HR, and legal, for example, are functions easily outsourced without sacrificing quality and efficiency of service. While there may be instances where outsourcing is used as a temporary solution, most companies find that outsourcing is preferable to hiring for many reasons. False Monthly outsourcing fees are often the same or less than the cost of hiring a full time employee. Outsourcing is the better value because you get an entire team of accountants managing your accounting. You’ll have a bookkeeper performing daily tasks, but you’ll also have the attention of, and access to, controller and CFO level professionals. False Outsourcing firms recognize that being up to speed on the latest technologies, tools and best practices is their competitive differentiator. A recent survey revealed that freelancers/outsourcers participate in more training more frequently than their on-staff, salaried counterparts. Driven by the desire to be a better choice for prospective clients, freelancers and outsourcing professionals often pursue their continuing education and training after hours and on weekends – something most employers would not ask their employees to do. False Outsourcing is perfect for startups because financial statements and analysis is always up-to-date and puts you in a better position as you look for additional rounds of funding. Your board will enjoy peace of mind knowing that the very best accounting practices are in place and that administrative staffing is lean. You can focus on hiring the type of talent essential to fulfilling business objectives. False One of the outsourcing benefits savvy CEOs enjoy the most is the speed with which we can move from discovery to set up to implementation. From then on, you’ll receive your reports on time, according to schedule. You’ll have more time for analysis and you’ll be able to address problems promptly as well as identify and act on opportunities quickly. Hopefully we’ve done a convincing job of myth-busting the common misperceptions around outsourcing. Outsourcing firms have become more sophisticated and specialized thanks to cloud-based technology and automation. Let’s talk about whether outsourcing would benefit your organization. We’ll be happy to talk about the specific needs of your business and the approach we would take to optimizing your accounting functions.